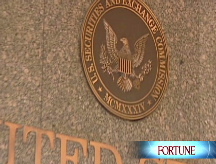 Judge declines government request to revoke financier's bail in $50 billion fraud case, but imposes new restrictions on his home detention. NEW YORK (CNNMoney.com) -- A judge ruled Monday that Bernard Madoff would not be sent to jail pending trial, declining a request by prosecutors to revoke the bail of the financier accused in a $50 billion fraud case. 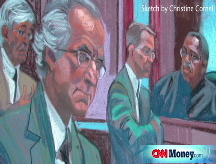 Madoff has been under house arrest, with electronic monitoring, since posting $10 million bail against his $7 million Manhattan apartment, where he lives with his wife, and against his wife's homes in Montauk, N.Y., and Palm Beach, Fla.
U.S. Magistrate Judge Ronald Ellis of the U.S. District Court of the Southern District of New York added conditions to the bail, including "restrictions of transfer of all property whatsoever, wherever located" belonging to Madoff. The judge also ruled that Madoff compile an inventory of all "valuable portable items" in his Manhattan home. The judge required that a security company check the inventory every two weeks and inspect outgoing mail. "The decision speaks for itself and we intend to comply with the judge's order," said Madoff's defense attorney, Ira Lee Sorkin. Janice Oh, spokeswoman for the prosecution, declined to comment. Prosecutors have been trying to put Madoff behind bars since last week. That's when the U.S. Department of Justice filed documents to Ellis accusing Madoff of shipping five packages containing more than $1 million worth of diamond-studded jewelry to family and friends, in violation of bail. Prosecutors said last Wednesday that Madoff was trying to protect these assets - which included 15 watches, four brooches, necklaces and rings - from seizure, preventing alleged victims from recovering their losses. Last week, defense lawyer Sorkin said Madoff didn't know he violated bail when he mailed these "sentimental" items, and that some of the packages were actually sent by his wife. Prosecutors on Thursday urged the judge once again to revoke bail, accusing Madoff of planning to transfer up to $300 million worth of assets - including 100 signed and ready-to-send checks found in his office, totaling $173 million. But on Monday, the judge released a statement saying "the new information provided by the government does not demonstrate either a serious risk of flight or serious risk of obstruction of justice." Madoff was arrested in December and charged with one count of securities fraud for allegedly stealing up to $50 billion from investors. If convicted, the 70-year-old could face up to 20 years in prison and a $5 million fine. Madoff's alleged scheme disrupted an already fragile financial system, affecting hedge funds and well-heeled investors from Wall Street, Palm Beach and Europe. Alleged victims included Banco Santander (STD) in Spain and HSBC (HBC) in Britain, as well as director Steven Spielberg and actor Kevin Bacon. In a Ponzi scheme, money from new investors is used to pay off early investors to create the appearance of legitimate returns. Madoff should be jailed - U.S.
Will Madoff's enablers get hard time? How much did the Madoff scheme cost?